Dog grooming is important for a healthy dog and to keep him looking and smelling good too. All dogs have an inclination to roll in something smelly if given a chance. Dog hair is, to some extent, self-cleaning - but not to the point that your dog will never need a bath! There will be times when you need to do some dog grooming and also bath your dog - so you should have got your puppy used to the process as early as possible. If you have a long-haired breed, you will need to regularly groom your dog - less so for the short or smooth coated breeds. Let's look at the different types of dog grooming you may have to do, according to breed, and then look at how to go about bathing your dog. Smooth coated dogs such as Boxers and Whippets are the easiest to look after when it comes to dog grooming. Use a chamois, hound glove or a soft bristle brush. Those that have a denser coat with an undercoat - such as Labradors - need more grooming as they moult a lot more - as anyone with a Lab will tell you! Use a bristle brush for them, and finish off with a comb paying particular attention to the tail and neck where the hair is thickest. Treat wiry-coated dogs in the same way, but with these, you will also need to have the longer hair 'stripped' once a month using a stripping comb. You will also need to take these breeds - Wire-haired Dachshunds and Fox Terriers for example - to a professional groomer about 3 or 4 times a year to have the coat reduced. Some dogs have long silky coats - Yorkshire Terriers and Maltese for example - and these need special care. They have little protective undercoat, so you need to be very gentle when grooming, mainly as they need daily brushing and combing. Other breeds have long but dense coats, such as Collies, and these require twice weekly brushing with a pin-brush and combing with a wide-toothed comb. Excess hair will need to be trimmed once a month. Golden Retrievers and others with less dense hair need less grooming - weekly brushing and combing and a twice-yearly trim for legs and between the toes. 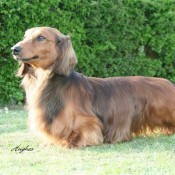 Other breeds require regular - often weekly or even twice weekly - professional trimming and clipping. Poodles and Bichon Frise, for example, need a lot of grooming, so you need to get your dog accustomed to these regular trips to the groomers from when he is a tiny puppy. Unless you are trained to do this clipping, don't attempt it yourself - leave it to the professionals. An undercoat rake or long toothed comb to remove loose hair; de-tangling solution or conditioner; a mat rake for dealing with those tangles; a shedding tool which is used for removing the soft undercoat when the dog is moulting; a slicker brush for giving a good shine to the surface coat. Not so many of these! A short curry brush for shine and polish; a short toothed comb for getting through any tangles and removing loose hair; a short bristle brush for removing hair and stimulating the skin. The basic techniques for dog grooming are straightforward but can vary for particular breeds - so this is a general overview. First get rid of any tangles using the comb or rake depending on the length of hair. Use a de-tangling solution for lousy matting. Work slowly from the tip to the skin and be gentle - try not to tug. Then use the brush and combs to remove dead and loose hair. You can rub against the lie of the fur to remove loose hair. Work all over the body, head and down the legs and tail. Then smooth and polish to give the coat a real shine. You don't need to bath your dog every time he gets a bit muddy - remove any dry mud with a brush and perhaps stand him in a bowl of water to wash his feet. Keep old towels especially for dog use. The time will come, though, when your dog needs a bath. If your dog is smelly, then wash it! However, if the smell returns immediately after you have bathed him, then it may indicate a skin disorder so seek advice from the vet. It is not usually necessary to wash a dog more than twice a month, and too much washing is bad for the dog's skin. If you have had your dog from being a puppy, then you should have followed puppy training advice and started acclimatising your dog to bathing early and rewarding him for good behaviour. If you have difficulties with your dog no enjoying his bath, then you need patience and continual praise and reward to overcome these problems. If you are bathing one of the larger breeds, get someone to help you as a wet dog can be pretty heavy! In mild weather, you can wash bath your dog outside using a spray attachment on a garden hose if you have one. Many dogs love to play in the water spray so it should be fun for all! If not then use your bath or shower, or even your sink if it is a small breed. Make sure the water is not too hot or too cold. Use a proprietary dog shampoo or baby shampoo - make sure it is very mild. Wet the dog all over before applying shampoo and gently massage into the coat. Take care of the mouth and eyes and don't get water in the ears. Talk and reassure your dog all the time if he is nervous and praise him when he is well-behaved. Rinse very thoroughly as residue shampoo on the skin can set off a reaction and upset the balance of the skin. Rub your dog vigorously using a towel to get rid of the excess water, but don't let the dog start pulling at the towel - this is not a game! You can use a hair-dryer to dry your dog - set at a low temperature. However, if you find that your dog is scared of the noise to try to acclimatise him with puppy noise training first - it can be used for dogs as well as puppies. In warm weather, you can dry the dog outside, but if it is cold then make sure he is completely dry before letting him out. If your dogs are anything like mine, the first thing they do after a bath is find something to roll in! But don't worry - that's the fun of dog grooming!